Halloween is a little over a month away and I am starting to plan out my costume for this year. 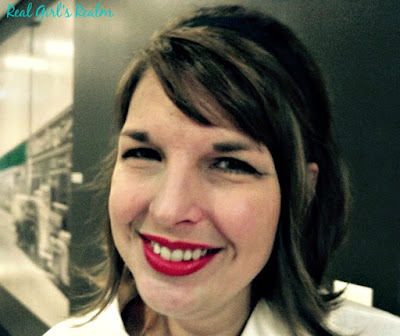 If you have read my "About Me" page, you will know I love dressing up for Halloween! Store bought costumes can be so expensive! Who wants to spend $60-100 on something you will wear once or twice? The last few years, I have made my own (thanks to Pinterest!) using things that I already had around the house or could buy cheaply. I spent less than $25 making these costumes! 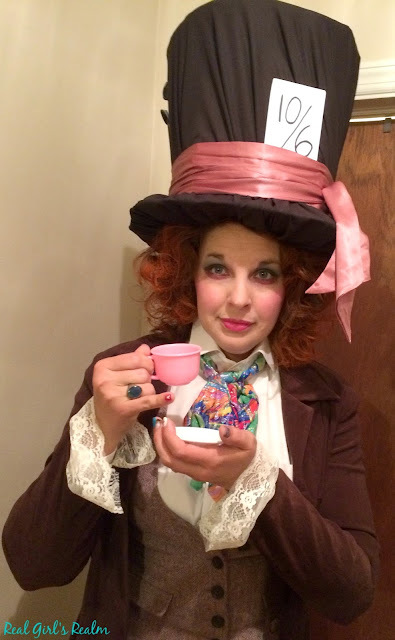 Last year, a few of my co-workers wanted to dress as characters from Alice in Wonderland. 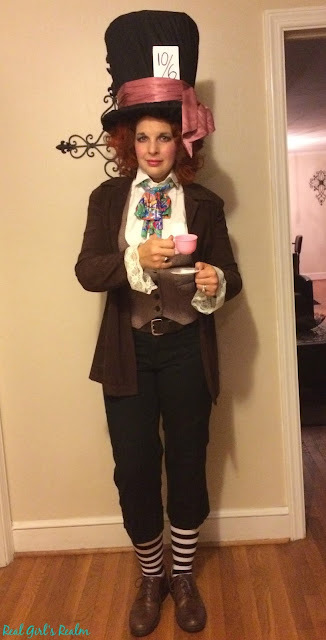 I immediately knew I wanted to be the Mad Hatter...the crazy looking Johnny Depp version! I immediate started pinning ideas and got to work making my hat. I made my hat out of cardboard that I already had, using the tutorial found HERE. Instead of velvet, I used a stretchy polyester type fabric, mainly because it was cheaper. I got the black fabric for the hat; colorful fabric for the bow; and lace cuffs for my sleeves, all from the fabric store for just around $10. Most of the clothes were from my own closet (or my husbands), but I did find the brown jacket at Goodwill for about $5. 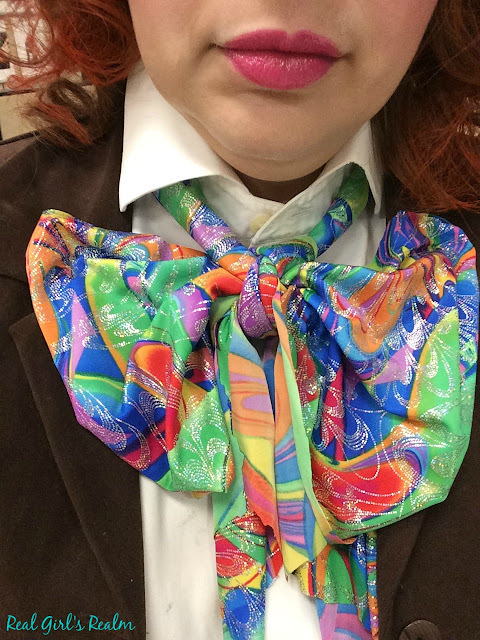 I hand tacked the lace onto the cuffs of the jacket and tied a bow out of the fabric strip around my neck. I curled and teased my hair and used orange hair spray to achieve a crazy look. I used bright blues and fuchsias for my makeup, which I based off of several looks I found on Pinterest. 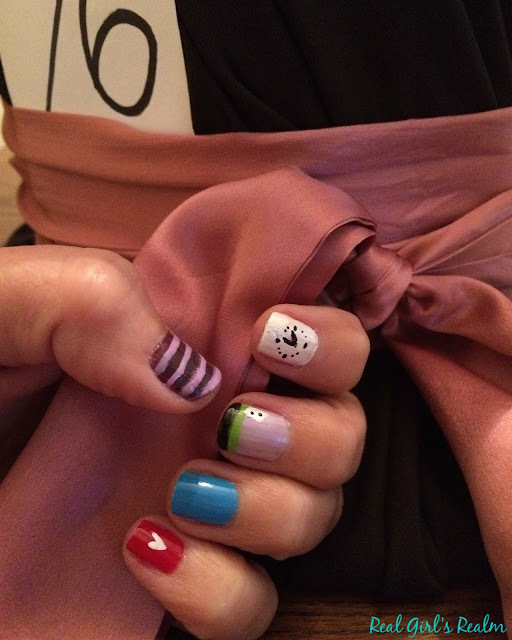 I borrowed the tea cup from my friends daughter and even painted my nails with the Alice in Wonderland theme! A lot of people did not even recognize me and our group was one of the winners of the office costume contest! 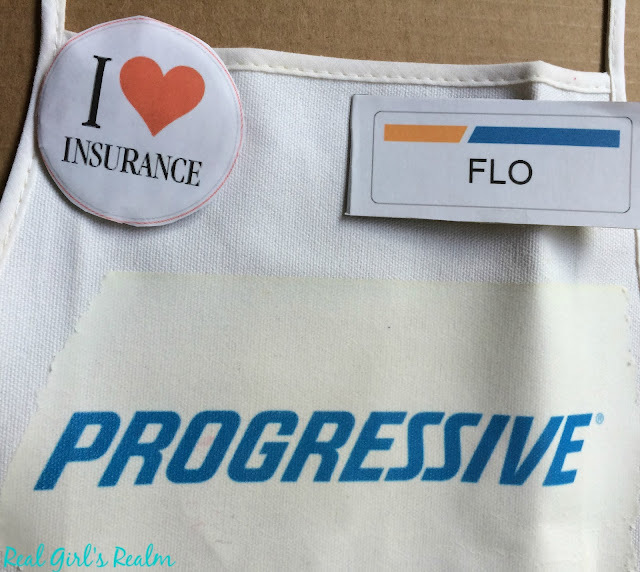 I purchased a white apron from the craft section in Walmart and used iron-on transfer paper to affix the Progressive logo. I printed out the logo and glued it onto a standard mailing box. My "buttons" are also made out of cardboard and printed logos, attached with a safety pin. You can find downloadable templates for the apron, box, and buttons HERE. Luckily my hair already looked a lot like hers, so I just teased the crown and added a black headband and her signature red lips. 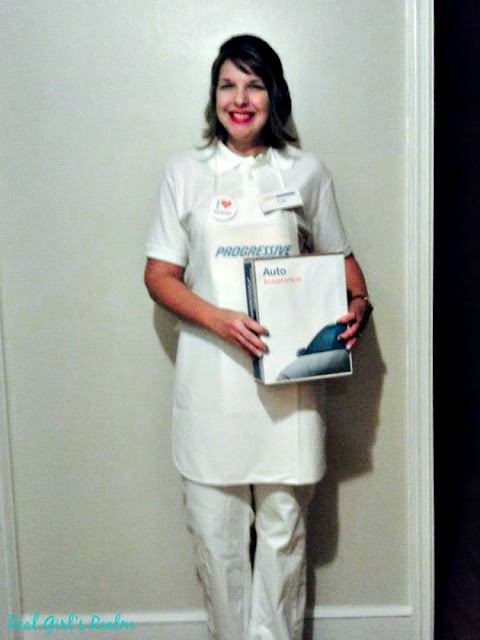 People still talk about my Flo costume and how much I looked like her! Which one of these is your favorite? 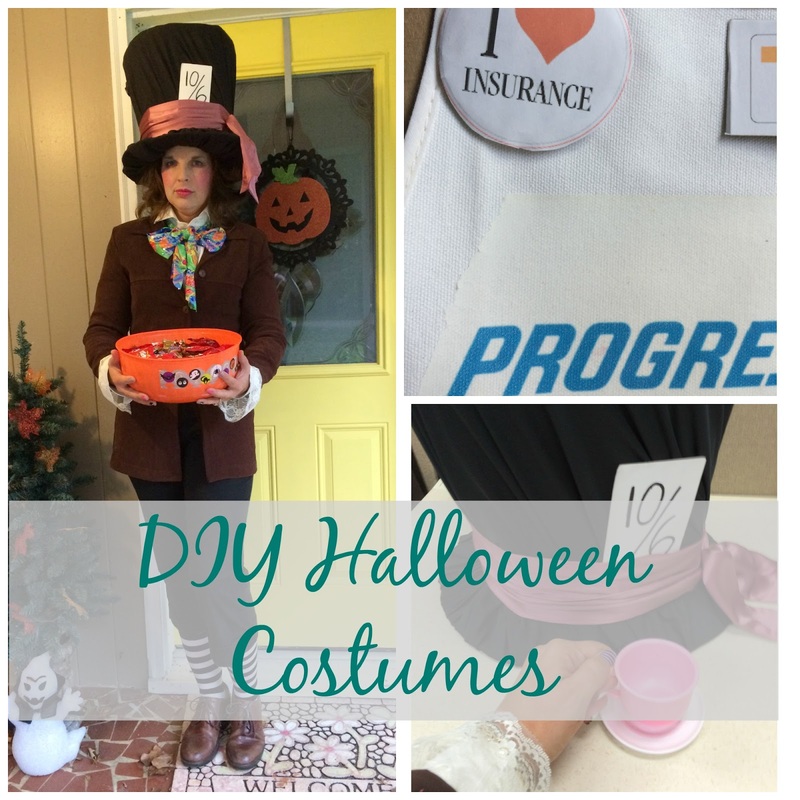 Do you have any DIY costume suggestions? For more Halloween ideas, be sure to follow my Pinterest board! OMG, both of these costumes are amazing!! Such a great idea! Thank you so much! I think the Mad Hatter has been my favorite one so far! I have to figure out what to be this year! Oh, I need to see your Mad Hatter; I bet it was great! I am trying to figure out what I am going to be too! I love DIY costumes! I've done my daughter's the past 2 years and this year I am trying to figure out how to make her into Papa Smurf (her choice, not mine). These are great ideas! DIY is the best way to go! Oh, I bet the Papa smurf costume will be so cute! I did not know the smurfs were still around! Thanks Ashley! I am proud of them! I can't wait to see what you decide. When I was pregnant, I went as a pumpkin! How great are these! I can see why your group won! I love DIY costumes so much better than store bought! I'm still working on my idea for this year. Thanks for the inspiration! I love the whole Alice and Wonderland theme. You nailed Flo as well! Thank you! I do too because they are unique. Alice in Wonderland has been my favorite theme so far! I know! People still talk about that costume!